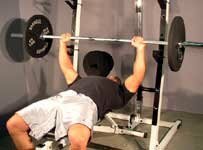 Targeting A Stubborn Chest - Working The Pecs, Part 2! My chest has improved tremendously over the last year and below I will describe a variation to my first Stubborn Chest routine... Get the latest on breaking your chest out of plateau! Everyone has a stubborn muscle group that just does not seem to want to grow. For me it is my chest. Or should I say was my chest. Over the past couple of years I have been trying various training routines and exercise techniques in order to make my chest grow. My chest has improved tremendously over the last year and below I will describe a variation to my first Stubborn Chest routine which can be read here. Targeting A Stubborn Chest - Working The Pecs! The Original "Stubborn Chest Routine"
*Depending on your recovery needs, you should do 1 or 2 sets for each angle. **All sets are stopping 1 rep shy of failure. Training just shy of failure will improve your recovery time and allow you to train your chest more frequently. While it would be nice to make consistent progress every workout, there are going to be times where your bench press strength will stall. This plateau of progress may last for a week or two or it may last for over a month. 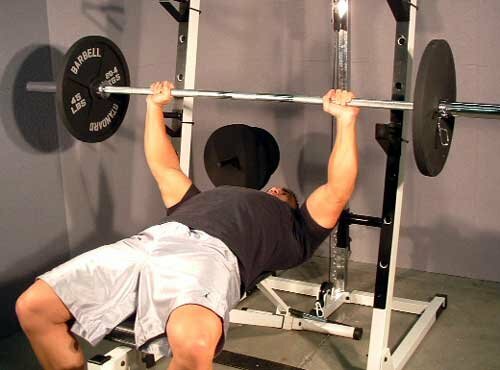 The purpose of this routine is to fight past this plateau in bench press strength. If you are doing the above Original Stubborn Chest Routine twice a week, you should incorporate this workout after 2-3 workouts of no progress. We are focusing on both strength and metabolic adaptations. By lifting a heavy load with shorter rest periods you are forcing your pecs to increase their ability to lift heavy when fatigued. 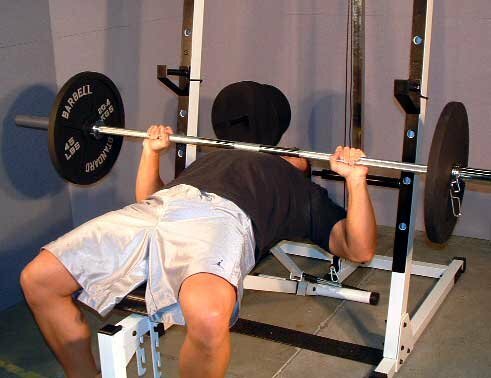 When you go back to bench in the 3-5 rep range the next workout, you should be able to beat your past plateau. Derek Performing The Bench Press. Another technique would be to instead of waiting until your strength stalls to add in this workout, do this workout every 4th workout. This would give you three workouts where you push yourself in the 3-5 rep range on bench press before throwing in the 10 sets of 3 reps at your 80% 3-RM workout. Click Here For A Printable Log Of The Plateau Stubborn Chest Routine. Other people have recommended the 10 X 3 approach before. 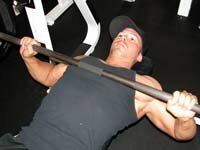 I am just taking it, applying my own little twist to it, and incorporating it into what I and others have found to be an effective chest workout for building both size and strength. If you have any questions about this routine feel free to email me at derek@scivation.com. Also check out my new personal training website www.beastpersonaltraining.com.